Are you a business owner looking at opening or renovating a commercial space? Congratulations! This is a significant milestone for your business. While having a space to call your own is an exciting step, it’s not without challenges. When construction begins, it is essential to know who your point person is. We cannot emphasize enough how important this is. Identifying and assigning your key roles in the project ensures that everyone is held responsible and accountable. Ensure this is clearly laid out from day one. Who will be handling all the details with the contractor and/ or designer? Will it be me, the business owner, or someone else? Who will be handling other portions of the work - setting up new utilities, moving coordination, etc. Who is my designer and what is their role? Do you have any key suppliers for equipment already? How will the flow of information flow between supplier and designer? Who is the general contractor? How well do these roles interact? Does your designer and contractor work well together? Who will be responsible for upcoming issues? Do I need additional support to complete this project? 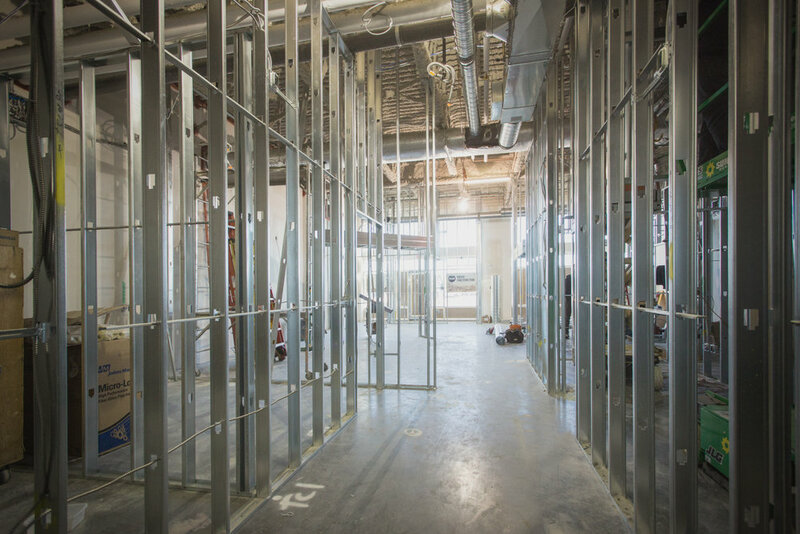 While it’s important to have a construction schedule and budget determined prior to the work beginning, it is always critical to have contingency plans in place. Unfortunately, not everything is always on the timeline or budget that you have planned for. As a business owner, you should always budget more time than you think you need especially when it comes to design, permit applications and the build-out phase. Every project and every space is unique. There are also a lot of areas out of your teams control such as permit application times or inspection turnarounds. The more prepared you are in order to answer design queries, equipment or furniture decisions etc the quicker that part of the process will go. Read any marketing textbook and you’ll know that your customer is not anyone and everyone. Your target customer needs to be kept in mind when designing your commercial space. It’s important to view your design in the eyes of your customer, their expectations and their preferences. Think of unique ways that you can add value and ensure their experience at your business is memorable. For more ideas on how to build your brand with commercial design, download Rivet Management’s FREE guide. Before getting started on your commercial project, it’s imperative that your financing is set-up and ready to access. It’s important to be aware of how and when your bank or landlord will issue funds and let your contractor know the required submittals your financier requires upfront. For example, some landlords require the construction to be complete and completely paid prior to issuing any reimbursement funds. Many business owners are caught by surprise when they realize they have to build and pay, prior before receiving reimbursement for their work. Ensure you understand the financing process prior to beginning your construction. At Rivet Management, we believe in creating a seamless experience for our clients by offering full-service design and construction management services from one company and contact. We take care of it all for you and eliminate the guesswork of determining who is responsible for what aspect of your project or eliminating your need to liaise with multiple contacts. Leave your space in the hands of our capable, experienced team and we’ll ensure the execution of your project is flawless from all angles.